Now it’s time for some serious squonking with Geekvape’s Athena Squonk Kit – including an ultra-clean, top-airflow Athena BF RDA! Stylish and compact, the Athena mechanical squonk mod features a 25mm diameter tank plate with a self-adjusting 510 connector. The matching Athena BF RDA comes with a gold-plated, postless build-deck designed for cloud-busting big-coil builds! Mechanical mod safety is always a top priority, so the Athena mod comes with a highly effective battery isolating switch. This simple safety cut-out is positioned right below the Fire button. A single thumb-click toggles the switch between the firing and battery isolation positions. The Athena mod runs on a single 18650 battery (not included). A removable back plate makes it easy to switch batteries when your power runs low. Along with some stylish laser etching, the Athena mod’s 25ml diameter tank plate also incorporates a self-adjusting 510 pin. As well as automatically adjusting the connection to the Athena RDA, this well-made mod is also compatible with a wide range of bottom-feed (squonking) tanks and rebuildables from other manufacturers. The Athena squonk mod comes fitted with a 6.5ml capacity polythene squonk bottle. Geekvape have also included a silicone bottle in the kit for squonkers who prefer a softer squeeze. This affordable squonking kit comes with a 24mm diameter Athena BF RDA. Though the Athena atomizer is supplied fitted with a BF (bottom feed) positive pin, you’ll also find a standard pin in the spares bag. This will allow you to use the Athena RDA with a normal regulated box mod or a mechanical mod. The Athena RDA features a dual-coil build deck, exquisitely plated with high-conductivity gold. Though the deck is classified as ‘postless’, your coil wires actually sit in chunky rectangular terminals. Aim for a coil height of 10mm, from the tips of the trimmed wires to the top of the coil. This will place your dual coils in the ideal position to receive the directed airflow from the dual, top-airflow slots. Along with the Athena squonk mod and RDA, you get a spares bag containing a 3-way build tool, a spare 510 drip-tip and adapter, spare tank seals and build deck terminal screws. To set-up your first build, you’ll need to supply your own DIY coils and wicking cotton. 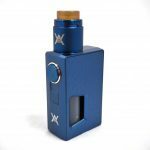 The Athena Squonk Kit comes fully colour coordinated with an Athena BF RDA in Black, Blue, Silver or Gunmetal. This Geekvape squonk kit doesn’t include a battery or e liquid. We have a great range of 18650 batteries in our Accessories pages. Click this E liquids link to view our superb range of e juices.